This entry was posted in Around the World and tagged Hexagonaria percarinata, Michigan, Petoskey Fossil, USA on April 24, 2019 by ren. 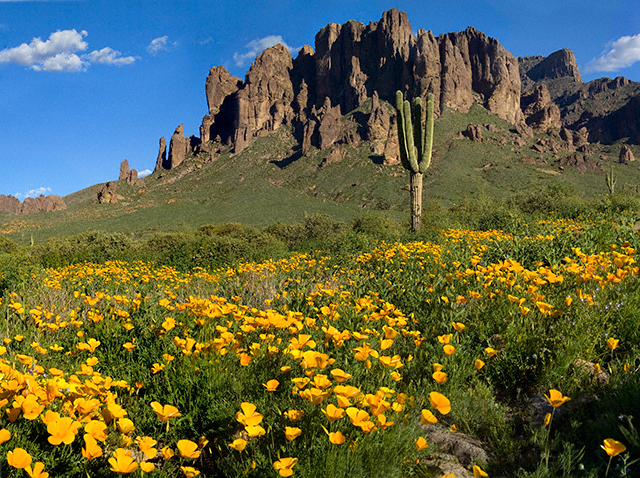 Mexican Poppies bloomed in profusion throughout the Superstitions after the plentiful winter rains of 2008. The four mile climb up the 2,000 foot eastern Superstition Wilderness bajada and escarpment consumed the morning and much of the afternoon. It was the 80 pound backpack that did it. Ten days of supplies, tent, equipment and 3.5 gallons (28 pounds) of water; enough food for a trek across the Superstition Wilderness, water enough for two days. One day in, one day out if the water could not be replenished. Mine was a water commitment, enough water storage to allow two days to trekking to another source. This entry was posted in Around the World and tagged Adventure, American Yucca, Backpacking, cactus blooms, century plant, hedgehog cactus, landscape, manzanita, mountain lion, Nature, Photography, prickly pear cactus, spring, trail 119, trail 122, Tule Canyon Trail, Two Bar Mountain, USA, wind on April 16, 2019 by MichaelStephenWills. [More nostalgia, this time when the K-Team from Switzerland visited my home town, Adelaide, and I, as the T-Team’s sole representative, helped show our visitors around the beautiful places so close to my home. This entry was posted in Around the World and tagged Adelaide Beaches, Around Adelaide, Australia, Australian adventures, Explore South Australia, Hallett Cove, T-Team Series on April 13, 2019 by lmkling. Thank you Mohamad for this fantastic experience of being a continued guest author on your blog. You have a wonderful following of beautiful people, whom I am grateful to be meeting along the way. Today I bring a favorite or rather a traditional food of the Upper Peninsula of Michigan in America. This entry was posted in Around the World and tagged copper mining, Michigan, pasty, USA on March 25, 2019 by ren. I extend my heartfelt gratitude to Mohamad for inviting me to be a guest author here on his blog and for allowing me to continue forth with more writings of the two American States (Michigan & California) that have been my home. You are very kind, Mohamad, thank you. I will continue with the State of Michigan, located in the northern Midwest of America. You can read an introduction to Michigan, here: Michigan USA ~ Welcome, in case you missed it. In that post, I explained how Michigan is actually two states and the only state like it. This entry was posted in Around the World and tagged Detroit, Mackinac Bridge, Michigan, Michigander, Tahquamenon Falls, Troll, USA, Yooper on March 14, 2019 by ren. I am grateful to Mohamad for inviting me to be a guest author on his blog. I will be writing more than one post, for I have a lot to share in the “Around the World” category. I will be focusing on one of the two states where I have lived in America: Michigan and California. Knowing Michigan (mIH-shih-guhn) the best, I will begin with a poem I created. If you are not familiar with Michigan, you are in for quite a treat, for it is the only state in America, of its kind. This entry was posted in Around the World and tagged Great Lakes, Mackinac Bridge, Michigan, USA on March 8, 2019 by ren.